Attention all busy teachers & moms! Do your grocery lists look like a mishmash of hand-written notes scribbled on scraps of paper? Do you ever head to the store without a list, thinking you'll remember what you need to get? Ditch the dozens of scribbled lists – create a go-to grocery list to save time and shop smart! Instead of re-writing the same items week after week, use this easy print-and-go master list to keep track of items that you need. Simply highlight the items that you want to purchase. I keep this up on my fridge so I (and my husband!) can quickly mark what we need throughout the week. Then, when I’m ready to hit the grocery store, I grab the list and go! 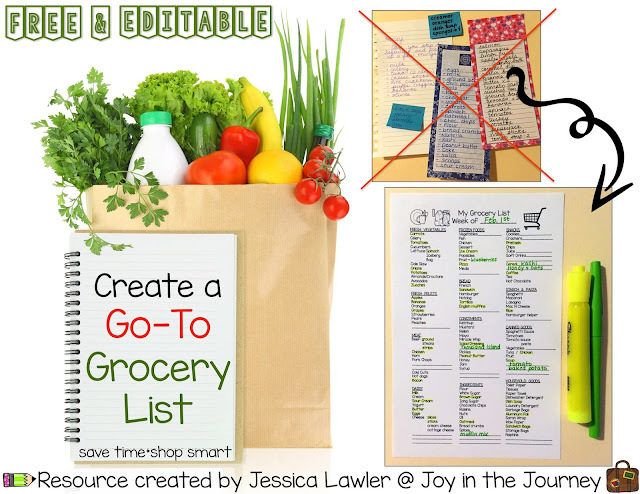 Because I created this product to be useful for busy teachers and moms, The Go-To Grocery List is a FREE & EDITABLE document– customize it to fit the items that you buy on a regular basis. You can also change the order to fit the layout of your particular grocery store. The extra lines for space for you to write in items you buy infrequently. Note: The page contains TWO identical lists to save on paper – so any changes you make to the left side, make sure to copy and paste it on the right.